The Rec Center is not closing from March 24 to April 7 as previously scheduled. Upper Noe Rec Center will remain operational between March 24 and April 7. Rec & Park abruptly cancelled the shut-down that was planned to allow workers to refinish the floors. They have not given any word yet whether the job will be rescheduled in 2015. The center will continue to operate on normal business hours, Tuesday – Friday 9 am – 9 pm and Saturday 9 am – 5 pm. Spring courses are in session. Little Kickers, Shred and Butter, Petite Bakers, and Future Chefs started on March 17. All other classes were pushed back to April 7 in anticipation of the planned maintenance closure. Visit www.noevalleyreccenter.com/ for registration information. One exciting addition for Spring is Home Cooking 101 on Wednesdays from 4/8 - 5/13, 6:30 - 8 p.m.
For a compete catalog of all Rec & Park offerings, go to www.sfreconline.org. See the daily schedule of Upper Noe programs and registration info. Remember that most classes at Upper Noe are open to drop-in guests for a small per-session fee. Check with Rec Center staff. 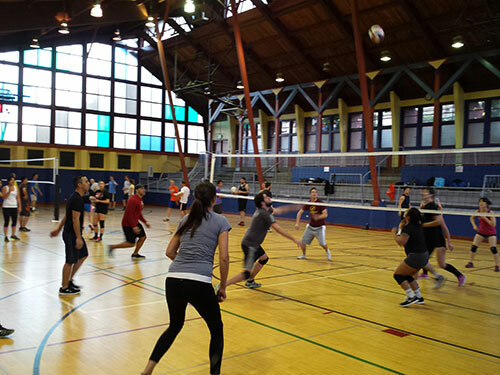 Free Wednesday night Drop-in Volleyball sessions have proved popular. So much so that Upper Noe will expand the play time by hosting pick up matches on Fridays, too, beginning April 3. Baseball season is back at Upper Noe with school league play. 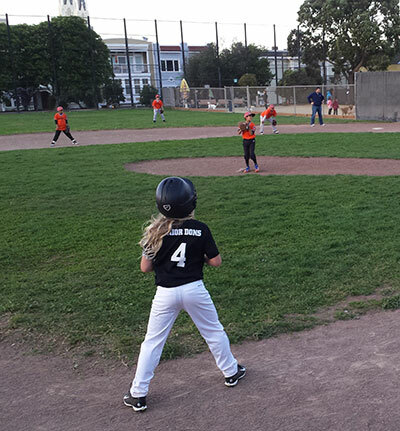 Our less-than-regulation size field is perfect for little sluggers. The games are fun to watch. Carl Nolte of the SF Chronicle strolled by a couple weeks ago and captured it perfectly. “Little kids were playing baseball in the warm sun, two teams, one in gray with pinstripes, the other in green. They were grammar school kids, the team in gray was from St. Anne’s, on the other side of town. The green team was from the Epiphany school in the Excelsior. They play in a Catholic school league, one of several baseball leagues for kids all over the city. It was organized: uniforms, batting helmets, metal bats, scoreboards, umpires, third base coaches, schedules, league standings, the big leagues written small.